Business has changed dramatically since the creation of America’s SBDCs, from the introduction of new technologies to the expansion of global trade. And America’s Small Business Development Center (SBDC) network has been there throughout — helping small businesses succeed, and helping aspiring entrepreneurs achieve the American dream of owning their own business. Today, a new business is opened by an SBDC in-depth client every 35.7 minutes; a new job is created in the U.S. by an SBDC in-depth client every 5.6 minutes; $100,000 in new sales are generated by SBDC in-depth clients every 7.5 minutes; and $100,000 in capital is obtained by SBDC in-depth clients every 8.9 minutes. America’s SBDC network is a partnership that includes the U.S. Congress, SBA, the private sector, and the colleges, universities and state governments that manage SBDCs across the nation. SBDCs provide management and technical assistance to an estimated one million small business owners and aspiring entrepreneurs each year. Small business owners and aspiring entrepreneurs can go to their local SBDCs for free, face-to-face business consulting and at-cost training on writing business plans, accessing capital, marketing, regulatory compliance, international trade and more. The story of how America’s Small Business Development Center Network grew — from a small pilot program to a nationwide business education and training infrastructure with nearly 1,000 centers throughout the nation providing management and technical assistance to over a million Americans annually — is a unique one. It chronicles the commitment of key federal lawmakers, training professionals, college and university officials, state and local policymakers, private and public sector partners, dedicated SBDC personnel, an active trade association and, most of all, the millions of small business men and women who have come to America’s SBDCs seeking to improve their lives through America’s free enterprise system. William Flewellen, Jr. (of the University of Georgia) and Reed Powell (of the California State Polytechnic University at Pomona), both of whom served on the SBA National Advisory Board, begin discussing the need for a program that combines the resources of higher education, government and the private sector to support the development of small businesses. The SBA implements a new University Business Development Center (UBDC) Program by funding a pilot initiative at California State Polytechnic University in Pomona, CA. Seven more universities are added to the network, in Georgia, California, Missouri, Nebraska, Maine, Florida and New Jersey. Senator Gaylord Nelson introduces the Small Business Development Center Act. The network grows to 16 participants, with the addition of centers in Arkansas, the District of Columbia, Minnesota, Pennsylvania, South Carolina, Utah and Washington State, and becomes known as the Small Business Development Center (SBDC) network. The Association of Small Business Development Centers is formed, and Larry Bramlett, Director of the Georgia SBDC, becomes the Association’s first president. President Carter signs legislation enacting the Small Business Development Centers network into law (P.L. 96-302). Massachusetts and Alabama are added to the network. Connecticut, Mississippi Kentucky, Iowa, Vermont, West Virginia and Delaware are added to the network. The SBA SBDC National Advisory Board is established. SBA appoints a Deputy Associate Administrator for Management Assistance (later to be known as the Associate Administrator for SBDCs). Ms. Johnnie Albertson manages the national program in that position for the greater part of 20 years. “Peer Reviews” are initiated and become the forerunner of the modern-day SBDC certification/accreditation program, which is provided for by statute. Rhode Island, Michigan, Louisiana, Kansas Illinois, Tennessee, Texas-Arlington, Oregon, New Hampshire, New York (SUNY), Oklahoma, Texas-Houston and North Carolina are added to the network. Indiana, Nevada, NY (Downstate) North Dakota, Puerto Rico, South Dakota, the Virgin Islands, Wyoming, Texas-Dallas, Texas-Lubbock, Texas-San Antonio, Ohio, Idaho and Alaska are added to the network. Arizona, Colorado, Maryland, Montana, New Mexico, Hawaii and Virginia are added to the network. The SBDC program returns to California after an absence of several years, establishing for the first time an SBDC program in every state in the nation. The Association of Small Business Development Centers (ASBDC) hosts its first national Professional Development Conference for SBDCs. Dr. James Chrisman publishes the first SBDC Economic Impact report on the nationwide impact of America’s SBDC network. Guam is added to the network. American Samoa is added to the network. Six regional SBDC programs are established in California, making 63 total SBDC programs. America’s SBDCs help in-depth consulting clients create a new job every 7 minutes; a new business every 33 minutes; $100,000 in sales every four minutes; and access $100,000 in capital every 15 minutes. America’s SBDC celebrates its 35th Anniversary. America’s SBDC network comprises nearly 1,000 centers across the nation, providing consulting, training and other services to approximately one million small business owners and aspiring entrepreneurs each year. 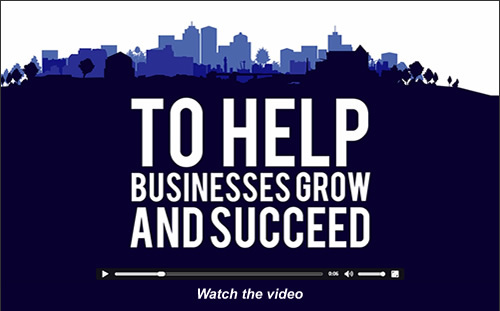 To learn more about what the SBDC program in your state is doing for small business, go to the SBDC locator and find out how SBDCs are helping businesses start, grow and thrive where you live. 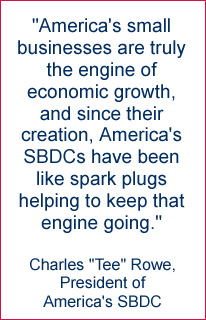 Want to learn more about America’s SBDC history? Click here.